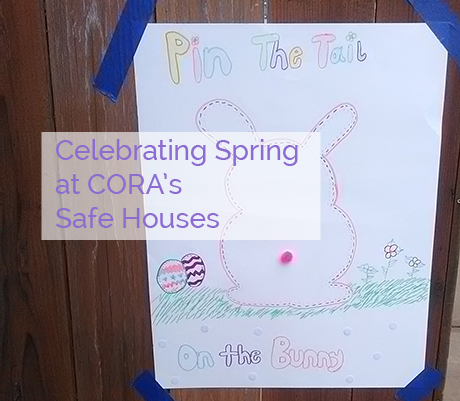 This week, the clients in CORA’s safe houses gathered together to celebrate their yearly Spring Celebration. We often talk about the challenges survivors face (and there are many), so we thought taking a moment to share a happy, fun moment would be a good idea. 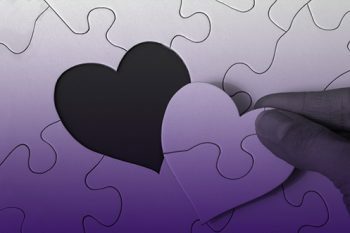 After all, the process of leaving and healing from domestic violence brings one more in line with joy. 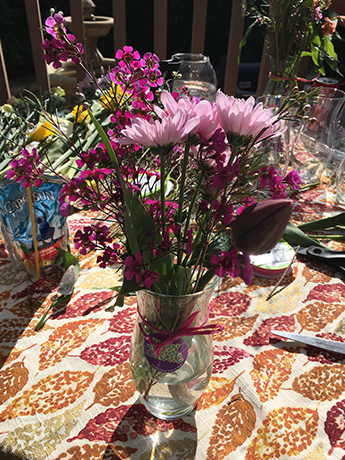 The day started out with Kimi, one of our Client Advocates, leading an intimate, family-bonding exercise that involved families gathering all manner of flowers and creating Spring arrangements. There were so many flowers to choose from! The families placed them in vases, creating a display they felt empowered by. There were tips on how to keep your flowers alive and also a special “potion of love” (ok, it was just water, but the kids loved it) that Kimi handed out for the mothers and children to add together. Priyanka, one of the amazing client advocates, was in charge of the egg hunt. She enlisted the help of Alondra and Zena, two other staff members, with a special mission. They secretly died the eggs and “hide” them throughout the safe house. 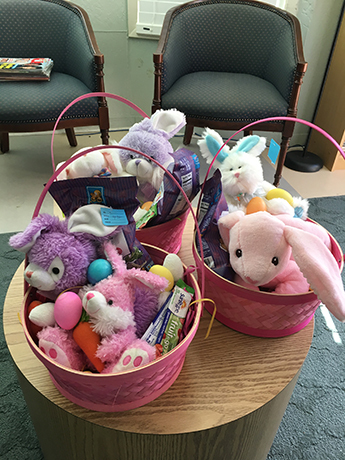 Each child was surprised with a specifically decorated basket and the hunt was on! Shouts of delight filled the air as children ran around the safe house grounds, yelling with lungs filled with excitement. When they resettled, there were baskets full of bright eggs and a sea of smiling faces. Alondra, client advocate extraordinaire, decided it was definitely time for a game. 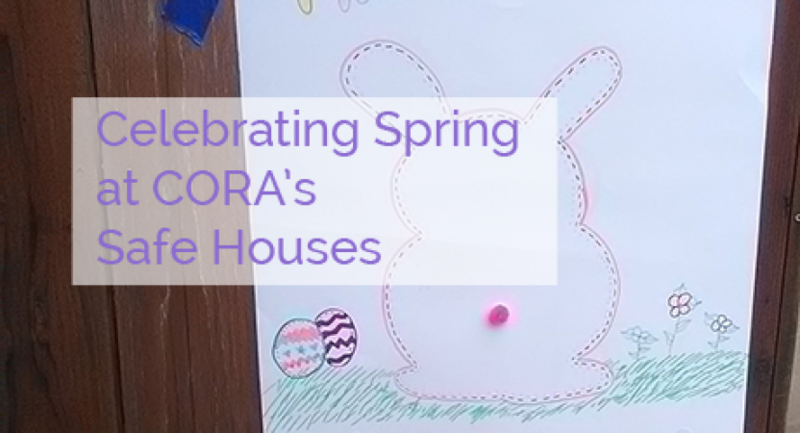 And what game do you play at a Spring Celebration? 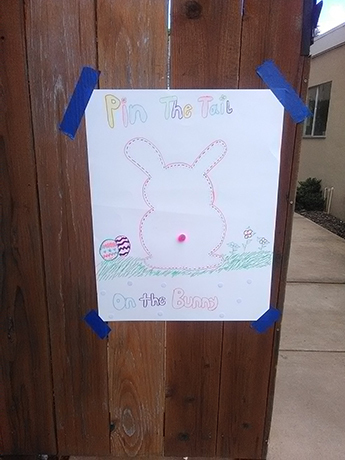 Pin the Tail on the Bunny, of course! Alondra carefully designed and decorated a board (it was too cute! ), taped it to the fence and the game began. 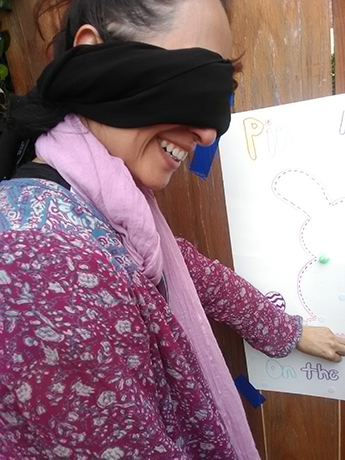 Patricia, another of our skilled client advocates, gathered the giddy children together and produced the blindfold. One-by-one the kiddos had their eyes covered, lifted the fluffy tail and enthusiastically headed for the bunny. Everyone watched in amazement. The children were so good at this, with minimal to no help! Next up were the moms. Priyanka held the tiny babies as the moms covered their eyes and tried to do as well as the kids. And they did pretty well … but we couldn’t say the same about the two staff members stepped up to give it a try. Zena, the Emergency Shelter Coordinator, had apparently invented a whole new game: pin the tail on the elevator door. Laughing all the way, surrounded by delighted children, Zena wandered out of the designated game area and was slowly making her way down the walk and out into the world. The children were there though and enjoyed righting her path and sending her in the right direction. Then Patricia took a turn and we all thought staff would redeem themselves … until she walked directly into a wall. There was so much laughter at that moment. So much happiness. The smiles on the faces of the families said it all. There was joy and there was hope. Domestic violence seemed so far away. In that moment, the staff even gave each other little looks. A recognition passed between everyone, a reminder of the importance of this work. CORA’s tag line felt real and solid: transforming lives. But the day wasn’t over. Alysha, who organized the whole event, knew it’s not a celebration until you eat and she was faced with the huge task of feeding everyone. Not to worry. There was beef brisket, hamburgers, all the necessary condiments (including some perfectly sautéed onions). There was juice, cookies and bright, Spring-themed cupcakes donated by the folks at Cake4Kids. Now with bellies full of food and spirit filled with cheer, the families began to unwind from the long day. It truly was a celebration … and it was more. It was about empowering personal choice with flowers. It was about finding joy in the unexpected of an egg hunt. It was about trust while pinning the tail on a bunny. It was about community and belonging. It was about hope and transforming lives.